Hope everyone has been enjoying the 2018 World Cup so far. Iran has Asia’s first win, Spain vs Portugal lived up to the hype. We at the Tavern are all rounding into file to prepare coverage for Korea’s turn on the stage as they face off against Sweden. In the “official” preview we will focus more on team selection, narratives, storylines, questions about Sweden and such, but this post will be more of a tactics -centric look at Korea’s opening group match. How will Sweden lineup? What can Korea do against their defensive system? Let’s break it down in depth. This is my first time doing this kind of post (previewing a match) and since it’s a World Cup match that everyone will be watching, I can’t really BS anyone. I’ve kept each section brief and concise for time’s sake, but if you have more questions then feel free to ask them and I’ll answer as best as I can with my very humble and moderate knowledge of Swedish football and modern tactics. That said, this will be two parts for time constraints on my end. The first part will be more about Sweden, the second part more about how Korea can beat or lose to Sweden. Sweden are a remarkably defensive side in a competition of defensive teams. Their no-nonsense, no-variables, defense-first approach worked very well in UEFA qualifying, including helping them see off a poor Italy in the play-off. They also generally stick to the same starting line-up, with the only question being if either Augustinsson or Olsson start as left-back. Either way, they both play very similarly for Sweden. We’ll get to more in a bit, but I can almost guarantee that this is the starting line-up for Sweden, just as I guaranteed the Honduras starting line-up in the 2016 Rio Olympics Quarter-Finals. On both occasions Shin Tae-yong came up against very defensive teams who obviously wanted to stick to the same players in order to not mess up their systems. As you may have heard, Sweden play in a simple 4-4-2 without the ball, which can adapt according to the opponent’s situation. However, Sweden seem like the side much more comfortable forcing the opponents to play on their terms rather than adjusting too much. Sweden are a side comfortable playing without possession. In fact, this is when they are at their best, so expect to be seeing a lot of that defensive shape. In World Cup qualifying, excluding games against Belarus, Bulgaria and Luxembourg, Sweden had between 35%-45% of possession, and just 26% in that 0-0 draw at the San Siro. They remain incredibly compact and rigid throughout the match, and can also shift from one side or another to choke off teams. They’ll even drop deeper, compact in between the banks and not too spread out, with the centre forwards truly being the first defenders. However, this isn’t to say that they are entirely going to sit back. Against Peru, their most recent international friendly, Sweden was very content to press any central midfielder coming deep to pick up the ball. Will Korea build-up through their full-backs as much? Probably not. Even though this was a hallmark of Shin Tae-yong’s Olympic side, the strength (I use the word lightly) in build-up lies very much with their centrebacks and defensive midfielders. But Sweden are capable of a restrained, situational press, and with the two centrebacks using their cover shadows to shield the ball off of Ki and his partner in midfield, the ball will inevitably go wide to create more angles (to a fullback or to a wide centreback in a 4-4-2 or 3-5-2 respectively). Thankfully it’s not a coordinated high press, which I feel Korea could struggle against, but Sweden isn’t going to completely rest on their laurels. Sweden prefer playing route one style football. They’re very direct and attempt to gain position high up the field through long-balls to their two 31 year old 6ft3 forwards in Toivonen and Berg. They’re tall, physical, elbows up kinds of forwards. As such, Sweden is set up to play to their strengths: though Sweden lack a really terrifying forward to run at defenders (I can guarantee there will be no 2014 Algeria moments where Slimani slices through the central defense like butter) they are adept at creating space to hit the long-ball. The key word there is “creating space”. Any team, and any player, can hit longballs up the pitch – it takes more technique to hit a long pass in gridiron football (NFL football) or ultimate frisbee or any sport without a round ball than in association football. Sweden, however, will never have that kind of “panicky 뻥축구” kind of approach where the long-balls are hopeful. Instead, Sweden’s directness is calculated. In Lindelof and Granqvist, they have two of Europe’s best ball-playing defenders with excellent pass completion. They remain calm under any sort of press, cycle the ball around with Olsen, the goalkeeper, and give themselves the space and time to go long. In this battle of two Nordic foes, Denmark tried to press Sweden deep, but Sweden doesn’t mind going all the way back to their goalkeeper if it means a quality long-ball can be played. They don’t get panicky. A lot has been made in the Korean media and among the players about winning the second ball. Inevitably on a long-ball, there’s usually three outcomes – a) attacking team heads the ball b) defensive team heads the ball c) ball misses everyone. With the exception of outcome c), most of the time whether the forward or the defender headed the ball, there’s going to be a battle for a second ball. In this instance, the Danish defender beats Berg, but the ball goes right in front of them. That’s when you notice the role of Emil Forsberg, RB Leipzig’s creative midfielder. Despite playing on the left, he tucks in because he is an immediate threat when teams are disorganized after battling for a long-ball, while the two Swedish central midfielders are honestly just two versions of Jung Woo-young – they’re just okay. Are you sure Forsberg’s a left midfielder? Sweden uses the central midfield smartly, and it’s important to think of it from a spacing perspective. 3 of Sweden’s midfielders are all in the area where the second ball will be competed for. There are five bodies in the same central space, with only one player (the RM) in any attacking wide area. In this situation, Sweden wins the battle and gets to ball to Forsberg, who plays a one-two with the forward Toivonen. This is very emblematic of Sweden in these scenarios – long-ball, squeeze centrally, win the second ball, get it to Forsberg, use the forwards for flick-ons or one-touch passes. In other words, you can clearly see Forsberg pinching centrally to try and have an immediate impact off of the longball. His determination, creativity and ability to start one-touch passing plays to get himself out of the congested second-ball scenario and into space is key. If Sweden are successful, they have bypassed any meaningless passing through the midfield or triangles or anything Spanish. Instead, they’ve gone straight into the opponent’s half. When Forsberg stays centrally, Sweden morphs into a situational 3-4-1-2. The left-back will push high up to support the play. Both Claesson and the left-back then become credible threats for crosses to the tall forwards. More often, however, Forsberg will try to use the strikers at feet, dribble quickly at defenders and penetrate the final third. However, he’s not going to make a solo run into the box or hit a throughball for these immobile forwards. 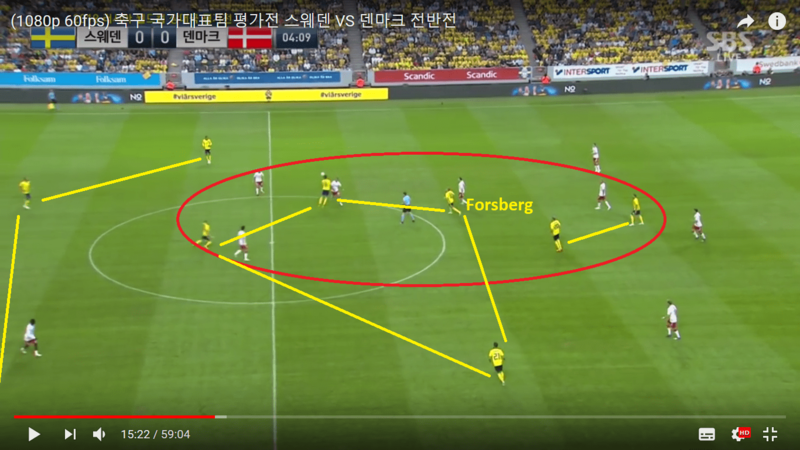 Forsberg’s central role is very much about bringing Sweden from stern defense to a credible attacking phase, after which crosses into the box are the best bet. Sweden also ensure that they remain invulnerable defensively due to Ekdal (the midfielder more on the left) switching with Forsberg to retain the defensive shape. Shin Tae-yong has said that Forsberg “only plays 10 mins. per match as a left-midfielder”. Perhaps 10 is a little low, but the point remains. Ekdal’s swapped places with Forsberg. This happens after Sweden lose the ball when Forsberg tucked in centrally. Alternatively, Sweden sometimes opt to completely de-congest the central midfield. Long-balls aren’t always effective and Forsberg can get lost in games if the second ball battle just isn’t going Sweden’s way. Because in Lindelof and Granqvist they have two excellent ball-playing centre-backs, Sweden occasionally build from the back. In the example below, Peru’s shape is kind of funny here because they all seem to be marking players that don’t exist. There’s a giant gaping hole in the midfield. The two Swedish central midfielders have peeled off beside the centre-backs in this instance to help with the build-up, and the only midfield player in that giant circle is – you guessed it – Emil Forsberg. They are not *disinterested* in the midfield, but giving themselves as many options to pass to Forsberg who is isolated (in a good way) with space to run into. Nothing much came out of this scenario, but it’s an example that can illustrate how Sweden can either congest or vacate the central midfield, but both times with Forsberg involved. Forsberg’s the man in the middle. He can turn quickly, run into the left half space and bring Sweden single-handedly to the final third again. A post-Zlatan Swedish side is organized, defensively rigid and always does the same thing in attack. The line-up is among the most predictable at the competition, as is the style of play. But it has worked well – to an extent. Their compactness has led them to keep clean sheets, but it has always been at the expense of goals. In this group, that deep congested shape may give them at best two draws against Mexico and Germany, and they are banking on their one star creative player and a healthy portion of directness to beat Korea. So as I finish up part two (to be posted soon), I leave you with this: how would you set up to defend Emil Forsberg? And can Korea really cope with a hailstorm of long-balls? Are players like Jung Woo-young able to step up and win the second ball? And how the heck does Korea break Sweden down, when defensive teams are Korea’s achilles’ heel? Wow. That’s the most in-depth analysis I’ve read. You should work for Fox Sports. So what do you think would be the best strategy? Or should we settle for a 0-0 draw? I think we should go all out and try to kill them because it’s our best chance of winning out of the 3 matches. That’s my high level analysis. The big overarching tournament strategy is to play to win all 3 points against Sweden followed by, well what you can call the cynical strategy – maybe play to a draw against Mexico. Sweden may have a good defense but their offense has struggled to get on scoreline in recent tuneups. The opportunity is there for Son, Lee Jae-Sung and Lee Seung-Woo to break down this stubborn defense. Neutral crowd for togo were actually booing korea…i remember that crap.. If we score the first goal we definitely are going to ask Sweden to come at us. It’s a sensible strategy honestly, as it makes them do things they don’t like to do (open up). But getting to that situation requires a lot of fortune in getting an early goal honestly. You’re right and this analysis is the best thing out there on the internet for our upcoming match against Sweden, at least from Korea’s perspective anyways. Yes great analysis Tim! I would stick with the 442, which seems to be KNT’s most comfortable formation. At the start of Sweden’s buildup play, Jung Woo-young should always be ready to drop back to win the second ball or at least be in a good position to help the back four. To deal with Forsberg’s threat in central positions, Korea’s back four should stay compact and the wingers should drop back to deal with overlapping fullbacks. Since it seems like Sweden’s leftbacks are more attacking than their rightbacks, I prefer the hardworking Lee Jae-sung or even Go Yo-han as the right sided midfielder/winger. Because Sweden’s compact 442 sometimes leaves the wings open, it’ll be crucial for Korea to exploit these areas. Like you said below, Ki will have to be the key man to quickly make switch passes to players out wide. I don’t think Korea can go all out attack because their attack isn’t good enough and we all know their defense is very poor. I think they’ll have to defend in numbers and pick their moments to attack in numbers. To be honest, I don’t see Korea winning this game. I think a draw is more likely. For Korea to have any chance of winning, they will probably have to rely on some mistakes from Sweden and/or a brilliant solo goal from someone like Son. I actually think Korea has a better chance of winning against a more attack-minded Mexico. You’ll hear it in the pod, but I do pin two players as “key players” in the game against Sweden, not least because the others had taken the more obvious ones (LSW, HHC, SHM). Jung Woo-young will be crucial in winning longballs. He needs to be more assertive and use his height and positioning to win those gritty battles, which he’s capable of but needs to elevate to a World cup level. Lee Yong as a rightback may be asked to drift inwards to mark Forsberg so he’s another important player too. For sure a 0-0 draw or a 1-0 win for someone off of a set piece is the most likely result, and against Mexico can be more “themselves” in terms of having space to run into on the counter or being more dynamic. I’m still not sure (and STY doesn’t either). If we match up 4-4-2 then Korea will need to be fluid. Use Ki to hit longballs out to wide players and 1v1, or try and use LJS-SHM-HHC-LSW movement to pull Sweden out of their shape. It’s remarkably difficult though and easier said than done. I think the more likely strategy is 3-5-2 with wingbacks using Sweden’s concession of wide spaces to whip crosses into KSW. Or you know, we could see a mix of both. One good thing about JWY (among few) is to drop in between CBs (he’s a CB at his club). Bring LJS and LSW in centrally, you got your 3-5-2. Excellent. I will enjoying some Kona coffee, toast, and eggs at my time zone. But I’ll probably need some soju if things start heading south quickly. Just saw highlights of Sweden versus Peru so take all of this with a grain of salt (sample size of 1): Wow, Sweden is organized and compact. They seem to consistently retain their shape. I think it will take a lot of quick passing and off the ball movement, which is where I think we really need Lee SW and Lee JS. In a match against Sweden with a bunch of aerial challenges and the need to tuck in on defense but also switch the field a bunch, Koo might be well equipped to pair with Ki? Also, let’s be clear: Peru had plenty of chances to score. There were at least a couple of decent opportunities on the break that I think Son and Hwang could convert. The Argentina v Iceland match just finished, and if Sweden is anything defensively like their Nordic brethren… that was suffocating. Also caught some Iran/Morocco yesterday, and watching Iran I remember thinking, “THIS is who SK had issues with?!”. You’re right lol. Nordic style teams are pretty suffocating (even Denmark, despite retaining some of their attacking football brand in from their Olsen days in 2000-2015, have moved to a more direct compact strategy than ever before to shore up the defense). It’s quite interesting in that that part of the world basically all plays the same way, all playing very direct. If we want to look on the bright side of life, the positive thing is Sweden literally has no idea wht STY is going to do. that’s mostly indecision, yes, but surely it has to have helped Korea to know what Sweden will do and look like (exactly, to every detail) while Sweden’s preparation probably has focused more on executing their game plan than worrying about Korea’s. And again, this is Sweden’s easiest game too. If it stays 0-0 for a long time something is going to have to give – a draw helps neither team. I’m thinking the pressure is on Sweden, they probably have the pre-game jitters. They haven’t been to the WC last time around and will have to beat Korea and Mexico to get out of the group. If they don’t beat us, it’s probably over for them as well.